Question: What type of wood is Restore-A-Deck used on? 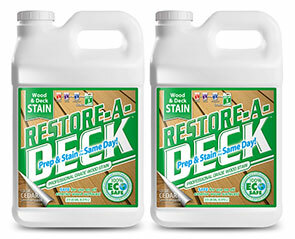 Answer: Restore-A-Deck is safe for all wood types including pressure-treated pine, cedar, redwood, ipe, and mahogany. 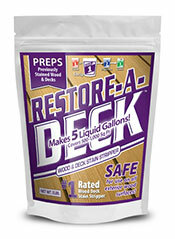 Question: What is in Restore-A-Deck? Answer: The majority ingredient in the cleaning formula is sodium percarbonate. This is the one recommended by the Western Red Cedar Lumber Association. There is also a blend of proprietary detergents that makes the cleaner work faster and more powerfully than just straight sodium percarbonate cleaners. 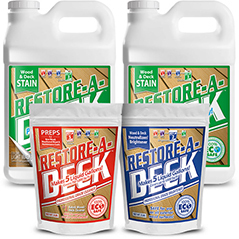 The Restore-A-Deck brightener is a blend of mild acids that is much less harsh on your wood than the straight oxalic acid. These formulas are the exact formulas we use professionally to clean and maintain decks every day. There is nothing comparable on the homeowner market. Question: Is your product just for wood that has already been sealed? My deck was just built. 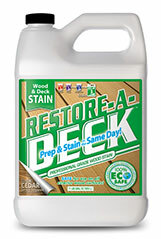 Answer: Restore-A-Deck can be used for maintenance cleaning, mild stripping, or to prepare new wood for sealer. For general cleaning, you would not allow the product to sit (dwell) for a long time before rinsing. For a more aggressive action, you would let the product dwell for a longer period. Question: How does the cost of your product compare to what I can get at my home center? Answer: Here is the best part, it's not only of much higher quality and more effective but in terms of time invested and harshness it's cheaper. By focusing on product development, we are able to offer a product that works effectively and does not cause the long term damage of bleach and soap cleaners. We are not shy in saying our product is the best out there for the money. Our smallest kit makes 5 gallons of cleaner and another 5 gallons of brightener. Your cost is about 5 cents per square foot. Question: Is your product safe for the environment? I don't like the idea of chemicals on my deck or in my soil. 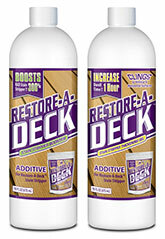 Answer: Restore-A-Deck is less abrasive to the wood than most of the products on the consumer market. Its primary ingredient is also found in OxyClean™. There are other proprietary chemicals in the formula, but all of them, once diluted with rinsing, meet all E.P.A standards for disposal and will safely drain into the soil without affecting the soil pH balance. As with the use of any type of detergent, please read the safety precautions page. Question: Can't I just use bleach and dish liquid on my deck? Answer: We do not recommend you use bleach (sodium hypochlorite) on your deck. Bleach attacks the lignin in wood. Lignin is the glue that binds wood fibers together. Without enough lignin in place, wood begins to break down more quickly. In addition, bleach imparts an unnatural whitening to the wood. This shows up very prominently when you apply a pigmented sealer as blotchiness. Every lumber association recommends against the using of bleach yet 90% of cleaning products available at your local home center contain bleach. Question: Why use any chemicals at all? Isn't using a pressure washer by itself good enough to do the job? Answer: In order for a pressure washer to adequately clean wood, you would need to use extreme pressure at the surface. This causes the wood to split and the grain to raise, both causing the surface to become unpleasant to walk upon. 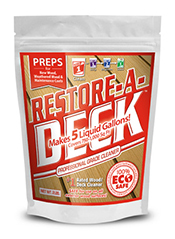 Using a proper detergent like Restore-A-Deck eliminates the need for highly pressurized water hitting the deck. You wouldn't take a shower without using soap or shampoo, nor would you wash your dishes with just water. The detergent does the cleaning, the water acts as the rinse. Question: Do I need to use a pressure washer if I'm using Retore-A-Deck? Answer: While initially, we wanted a product that would not need the added scrubbing action of a pressure washer, we feel it is safer to recommend one be used but with proper technique. In many cases, Restore-A-Deck will work it's magic and can be rinsed using some brushing and garden hose pressure. We have included a more detailed explanation page on proper pressure washer usage here. Question: What is included in the kit. What additional tools do I need? Answer: Your kit will include a container of the cleaning agent, a container of the brightening agent and detailed instructions. You will also need at least one pump up 3-gallon sprayer (we recommend two), safety goggles, and PVC gloves. Optional equipment may include a pressure washer and moisture meter. Question: I used Restore-A-Deck and it looks great! Now I want to seal in the beauty and protect it from the elements. What do you recommend? Answer: Allow the wood to dry for three to four days in direct sunlight (75+degrees F) Pick a quality sealer from a reputable dealer. We suggest the Woodrich Timber Oil, Hardwood Wiping Stain or Amstrong Clark. Question: I have leftover materials from your kit, should I throw them away? Answer: No way. Restore-A-Deck's cleaner is excellent for cleaning vinyl patio furniture, garage floors, house washing, you name it. The only time we recommend caution is around colorfast material. The brightener in your kit is also excellent for removing rust stains from concrete. Restore-A-Deck's materials have a shelf life of one year if kept sealed and dry. Question: I applied a sealer and I hate the color. Will your product remove this finish? Answer: That depends on a couple of factors. Will you be applying a sealer that is similar or darker in color? Also, how long has the sealer been exposed to the elements? Restore-A-Deck is an outstanding cleaner and a light duty stripper but it has its limitations. If the finish has been down for less than six months or if you are looking to change to a dramatically lighter colored finish you will need a heavy duty stripper made with sodium hydroxide. We have these available for contractors only as they are dangerous and caustic products. Restore-A-Deck will not remove paint or solid stain. I meant to include spindles in my question too. Thanks! Do you have any instructions/tips on what's the best way to apply the products on railings? I'll be applying RAD on a third story deck and I'm not sure how to properly apply RAD on railings, especially the ones facing outward. Thanks! I used RAD cleaner and brightened and then the stain in September. It looked great. After a winter of snow and rain, this Spring the deck is peeling in spots and there are white spots around some knots. What should I do to fix these unsightly spots? Lightly wash and reapply is the easiest thing to do. The reason this happened is due to the stain not being able to fully soak in correctly. The RAD is a penetrating stain and if not prepped correctly or over applied, it may dry on top of the wood instead of in the wood. Was this new wood? Did you do one or two coats? 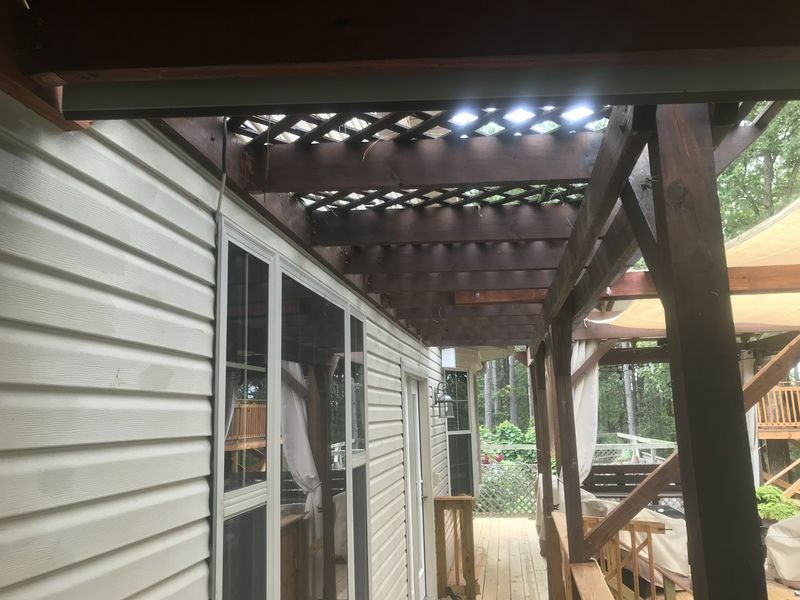 Applied to damp or dry deck? This was a new cedar deck. I waited 6 months before doing anything,per directions of the builder. It was applied to a damp deck and I only did one coat. Do I just clean it with the RAD cleaner and not use the brightened? Liz again... I am thinking I need sealer to beautify the wood but wondering if cleaning process next yr will be the same and also do you have a sealer that enriches the natural wood appearance that is not very shiny? A stain will enhance the natural look and provide UV protection. Use the RAD Semi-transparent stain in Light Walnut. Same prep next year. Clean and reapply the stain. It is a penetrating stain and does not create a shine. Just one coat annually for IPE. I also need to clean house with bleach based product...should that be done before using your two step product? Ipe deck is three yrs old and I do not think it has any product on it...if I clean and brighten annually does it need a sealer? I like the natural color and do not want shine...any advice would be appreciated! Prep the house before the deck. You will have to clean 2-3 times a year if you do not stain the IPE to maintain a clean (not gray) look. If you are okay with graying, just clean annually. I have a pier over a fresh water lake. 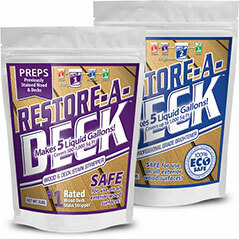 Are the restore-a-deck products safe to use without harming aquatic life and water fowl? The lake is regulated by the Army Corp of Engineers and has some very strict regulations. Yes the RAD clean and brightener are eco-safe. I am having an issue with my newly treated deck (not previously stained). I purchased and applied the RAD cleaner and brightner last summer and it cleaned and brightened the wood amazingly. I purchased the RAD stain (light walnut) and completed the project in late summer. I now have green mildew starting to form in several sectio0ns and just noticed this week that the stain is peeling in several places. It hasn't even been on 6 months. What can be done about this? Sounds like you may have over applied your first coat. 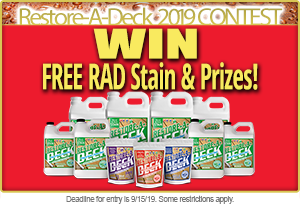 While RAD will not promote the growth of mildew/mold in the stain coating, it is impossible for any brand of stain to prevent the growth of mildew/mold on top of the stain. I applied one coat and a second wet on wet. Followed the instructions on the label. How do I address the peeling? Says online to wait 12-18 months before doing maintenance applications. Would prefer to keep the peeling from getting worse before that time if possible. The instructions state only one coat for new wood. Applying two coats to new wood would cause this over application. This is due to the new wood not being absorbent enough to accept two coats. You can prep and do another coat now. Thank you. The wood on the deck was approximately 6-8 years old with no previous stain or treatment. It had weathered, however, the cleaner and brightner did a nice job restoring it to a fresh condition. Also, how do you recommend removing green mildew substance on top of newly stained wood? The cleaner (step 1) or would that be too harsh? Use the cleaner for the prep. I just finished staining my deck with the light walnut after cleaning and brightening with RAD. I applied 2 coats about 30 minutes apart as I went. Most of it looks great but there are some light spots that look like it may have penetrated in more than the other grain on each board Can I go back over the boards now with a light coat. It has been a couple of days. Will it penetrate or just sit on top? Thanks. It will not soak in at this point since it already cured. Best would be to wait until Summer and lightly rinse off any dirt and apply a light coat then. Rinse with water or a cleaner? Depends on how dirty it is. Light wash with the deck cleaner and rinse with water should work. I just used the restore-a-deck cleaner and brightener. It was amazing. My porch is brand new and I couldn't imagine that new wood could look even better when cleaned. Unfortunately, I didn't notice that I missed a few spots before using the brightener. Can I re-apply the cleaner in some small spots? would I need to use the brightener again in those spots as well? Yes, you can spot clean but you will need to brighten all the wood to even out the color when done. Where is the best place for me to leave a RAVE review? This product is exceptional! Best stain ever. And the deck brush is amazing. We stained in a day. Its too dark for a picture now! I’m re staining my pillars under my pavillon.. they are pretty clean with no mildew do I need to use cleaner before restraining. We would use a cleaner and light pressure washing. Do I need to use a brightner to neutralize the cleaner? Not needed for your scenario. What is longest time I can wait after I use the cleaner and brightner to stain. I know at least 48hrs...but how many days do I have. I have a rather large deck. The directions for the cleaner/brightener are to apply the brightener immediately after the cleaner while the wood is still wet. This can make it difficult to clean the entire deck (deck and railings) before applying the brightener and still have the wood be wet. How important is it for the wood to still be wet from the cleaning when applying the brightener? What is the recommended way to clean/brighten piecemeal? Is it important to not get cleaner on wood that has already been brightened? One option would seem to be to clean/brighten the railings first (as excess can drip on the deck) and then do the deck, hoping too much cleaner doesn't splash onto the railings (I'll be using a pressure washer)? Can the same sprayer be used for both cleaning and brightening if used piecemeal (clean, brighten, clean, brighten...)? Just apply the brightener as soon as the cleaning is fully done. 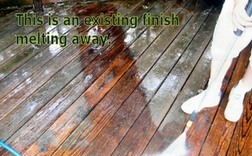 You can always mist the deck first as well if the wood has started to dry. Do all the cleaning first and then all the brightening after. For an old fence, how do you determine whether your first step should be a cleaner or a stripper? If the original stain is virtually non-existent, then go with the cleaner; otherwise, go with the stripper? In other words, what is the key deciding criterion when deciding between using a cleaner or a stripper? This June my deck was 1 year old, unfinished. I applied the cleaner and brightener then used Olympic solid stain. As you can see from the picture I did not get to complete the staining. The only area that got two coats of stain is the part you actually walk on. The rest is either one or no coat at all. My question is, now that I'm ready to complete the job do i need to clean and brighten the entire deck or just concentrate on the unstained areas? Will the cleaning and brightening affect the areas that do have one or two coats of stain on them? 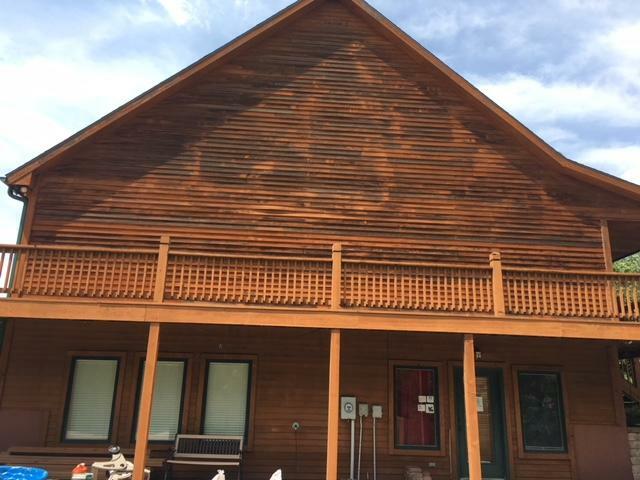 Just lightly pressure wash all the unstained wood with water and you should be okay. I've never pressure washed before. Can you tell me which tip and what pressure to use? Green or white tip and just lightly wash from 10-12 inches away. I just ordered some product from your website. Unfortunately, I couldn't find anything telling me how long to ship or when I might expect delivery. Approximately how long from ordering to delivery? 2-5 business days depending on where you live. Will you deliver to a business? I will be out of town for a couple of days next week so I would like to have my order delivered to my workplace. Is this possible? Yes, we deliver to business addresses all the time. Clean-up of which product? All RAD products are water-based with soap and water cleanup. we just stained our deck ran short on stain, tried to stretch it to get it done but a few boards did not get the same amount of stain as the rest and dried a lighter color. how do I fix it? can I sand those boards and restain or do I need to use the stripper before I restain. It would be easiest to sand those boards as you cannot spot strip them. We have recently installed cedar fences (2-3 months). Good neighbor, one side is smooth and the other side rough. There are rain and slight dirt stains, mostly near the bottom. 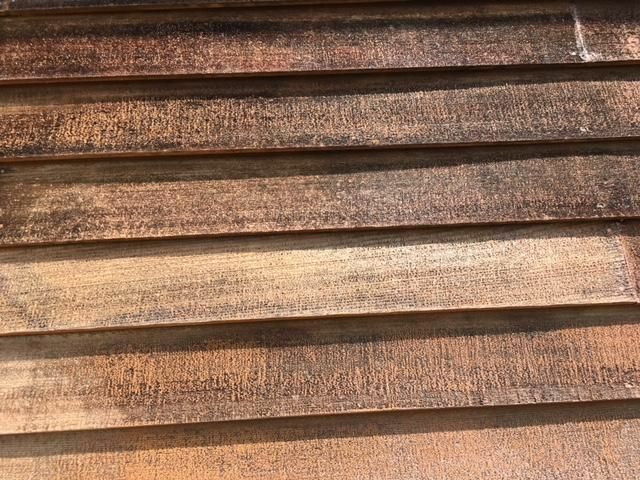 Would a pressure wash (25* tip @ 18") with plain water be sufficient to prepare fence before applying your Cedar Semi-Transparent stain? What would be the best application: brush, roller, airless paint sprayer or garden sprayer? Thank you. Sorry but no, this is not a result of the prep products or stain. Spaces or gaps between the deck boards and the joists would cause the squeaks. Maybe the pressure washing loosened your nails or screws? You could try tightening them to see if that helps. "Restore-A-Deck's materials have a shelf life of one year if kept sealed and dry" .....Do I understand that if you do not use all the stripper, cleaner, or brightener it can only be kept a year even though the deck won't need it again for a few years? How long can the product be used after mixing it with water? Say I we clean one deck but then need to wait a few weeks to clean another but there is already mixed product left over. What if the product has never been opened.....is the shelf life still only a year? If unmixed it can be stored and last for about a year in opened but possibly longer. Once mixed, the cleaner will not last more than a day. The Stripper and Brightener will last a year or so. An unopened product would last a few years if stored in a temperature controlled room. To make sure I understand your answer, the cleaner after mixed will not last more than a day BUT the Stripper and Brightener will last a year or so even after mixed, is that correct? What is the shelf life of the RAD stain unopened? opened? Yes, that is correct. Same with the stain as the cleaners. Opened about a year (possibly longer), unopened would be many years but has to be stored in a temperature controlled room. I have a flat roof with a deck on top of it. The wood currently is not stained so I am planning to clean and brighten it. Will this product harm my roof underneath?? I wish there was a question about "timing" on the FAQ page. Two questions I have is what is the preferred window between putting down the cleaner and the brightener. Can I wait a couple of days, a week or 2 weeks? And what is the time window between the brightener and the stain? I heard 14 days is the max from one of the threads. Thanks. You brighten the wood right away to neutralize the cleaner on the same day, not days or weeks later. Stain within a couple of weeks is best. I just want to make sure I understand this correctly. 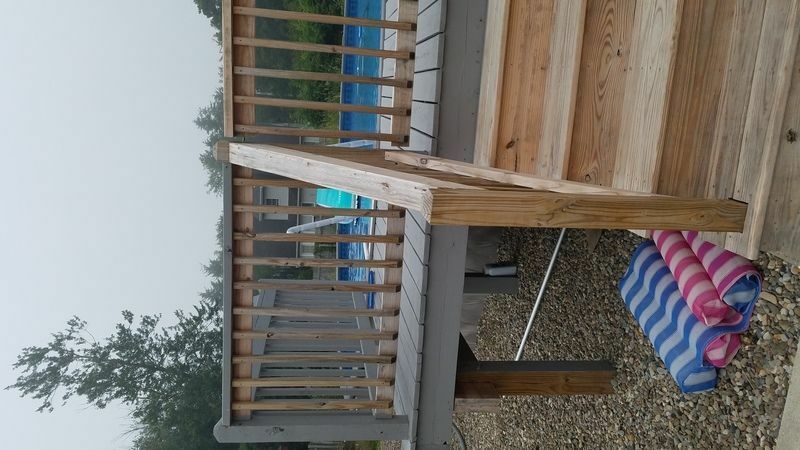 Before staining, I should use Deck Cleaner and then the Brightener but if I need to remove the previous stain I shouldn't use the Deck Cleaner but use the Stripper and then the Brightener, correct? And what is the difference between the Brightener and the Stripper? They appear to both contain acids? Stripper does not contain acids. If you are stripping, you do not need the cleaner. Both the cleaner and the brightener needs to be neutralized with the brightener. Hi! I have raw wood that has never been previously finished but has significantly grayed. Do I need both the cleaner and brightener, or will just the cleaner do the trick? Thank you! Both the cleaner and the brightener. 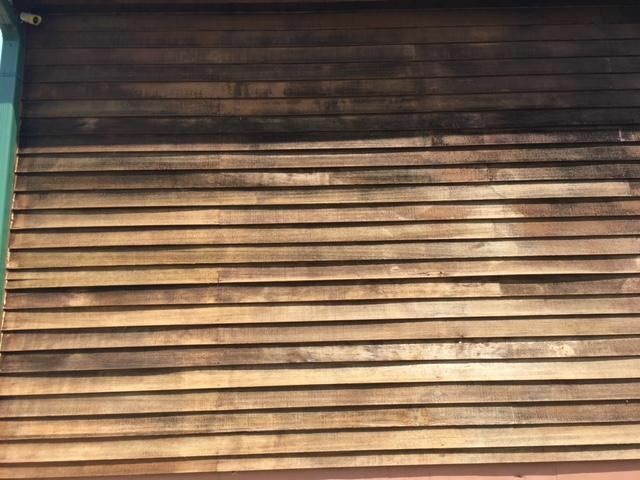 Questions - we are having some difficulty in removing what appears to be mold on our western red cedar siding. We have tried the stripper on 2 different days. We have not attempted the brightener yet as we can't get the siding clean. 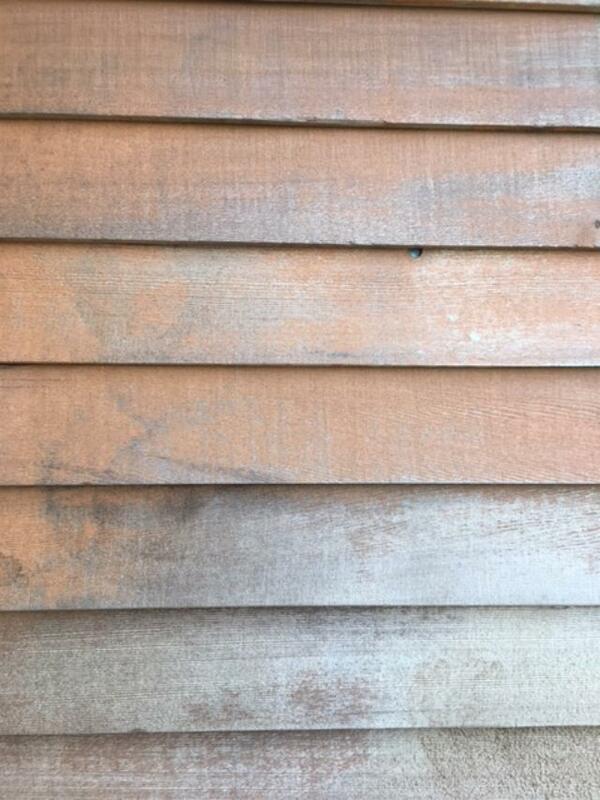 Our siding has had 2 coats of Olympic oil based stain from 2007. We are testing our skills on a smaller wall on the west side of our house. We have a west side and a south side that are the worst. The rest isn't that bad and don't show mold or the black stuff. First day - we applied the stripper and most likely allowed it to dry out a bit by applying it in too large of an area and the weather was very hot. So even with scrubbing, we found it difficult to remove. Second day - back at it with a different plan. Applied in a smaller section, this time, tried to keep it wet, 10 minutes - re-wet the area a bit with some diluted stripper after 10 min and allowed it to sit for 5 more minutes - scrubbed a bit as it seemed to be working. Power washed and once again, it just wasn't coming off very well. Our concern is if we can't figure this out - my husband is doomed when he rents the lift and starts on the large south wall later this month. What are we doing wrong, or what can we do better to make this succeed without killing ourselves? Thanks! Pics are of the west wall after the 2 stripper applications and the incoming doomsday south wall with the same problem. This does not look like mold but old stain that has turned black. It should come off with a stripper and pressure washing with no issue. Do in sections of 200 sq feet at a time. Apply stripper and wait 10 minutes. Pressure wash off. We've already used the stripper twice and pressure washed. (that's the results in the first few photos) It's still not coming off easily. Should we wait longer than 10 -15 minutes? Try getting closer to the wood with the pressure washer. It will come off. About 6-8 inches away from the wood.